It had been already a very old idea, to have a Salvatorian community in the Philippines. 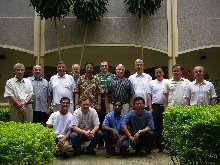 When the Salvatorian Sisters started a foundation in the Philippines in 1974, the Fathers and Brothers felt also more encouraged to open a foundation for the male branch of the society, but it was only in April 1996 when a group of four Polish fathers was able to start the first community in the Philippines. 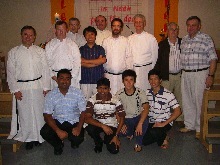 After the General Chapter in 1999 this new foundation was supposed to become a kind of formation center for East Asia. From that time on the membership grew remarkably. After 14 years only, we are 58 members (including candidates and aspirants) from Poland, United States, Germany, China, Vietnam, Sri Lanka and the Philippines. Early in 2001 we were able to transfer to our newly purchased, extended and renovated house in Loyola Heights, which is nowadays the Father Otto Hopfenmüller House. It was our first house, which we owned in the Philippines. It serves as novitiate house and headquarters of our administration. 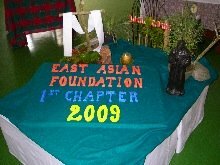 In 2002 we constructed a new house in Amadeo, Cavite. This is the Father Jordan Formation House, which serves as study house for the philosophers and a small group of theologians. In the beginning of 2004 we were able to open a third formation house in New Manila. At present it is being totally reconstructed and will soon be opened as formation house for the theologians and the language students. 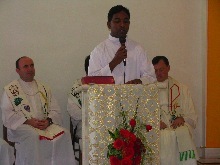 Now in 2010 we are about to intensify our efforts to do apostolic work in the Philippines, and we are at the brink of a new foundation in Sri Lanka. With God’s help the East Asian Mission Vicariate will undergo a good development, so that we may proclaim the savior to more people in Asia while following the inspiration of our founder Fr. Francis Jordan.